At the end of the 1990s, Vroom Funderingstechnieken acquired VCA and NEN-EN-ISO 9001 certification. After both audits it was clear that the company was on track in terms of VCA and ISO. The company was one of the first to be audited under the new 'tighter’ criteria for VCA certification. The NEN-EN-ISO 9001 certification is a justification of the production process, internal procedures and the working method for the various foundation systems, from start to finish. VCA stands for VGM (Health, safety and the environment) Checklist Aannemers and VCA certification is awarded to contractors that carry out foundation work and other work associated with that. 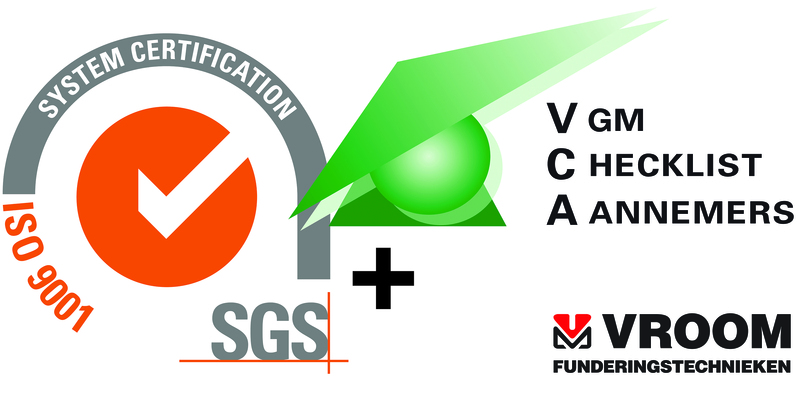 Vroom Funderingstechnieken was awarded VCA** (two-star) certification. Both of these certificates mean that Vroom Funderingstechnieken has a policy in place in respect of quality, working conditions and the environment. The Quality, Working Conditions and the Environment co-ordinator monitors all registrations in the context of VCA and ISO. ISO 9001 operates at document level and concerns communication within the company in relation to management and improvement of quality within the organisation. This includes, for instance, a customer-satisfaction survey. Of course this has an effect on the resources and the processes that are deployed, and the way in which this is set out on paper and in a script. VCA, on the other hand, is concerned with safety, working conditions and the environment. Vroom Funderingstechnieken has recorded what has been done in this area, and that can be audited. Project managers, machine operators and others take part in consultations in the context of health and safety at work, and the environment, which results in solutions being found or tailor-made instructions being drafted. That both audits have been completed satisfactorily is a compliment to the Vroom Funderingstechnieken workforce who are well aware of the risks that the job entails. Vroom Funderingstechnieken has a duty of care in respect of health and safety at work, and the environment, and complies with this. Contact Albert Strijk. Dial +31(0)299 409 570 or send us an e-mail.